Losing a faithful companion is difficult for the family. 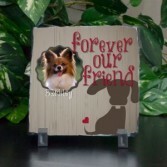 Your pet was definitely a loved member and paying tribute to their companionship after they are gone is easy with this beautiful personalized stone plaque. 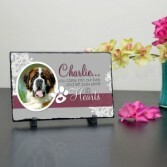 Measuring 5.5"x 5.5", this full-color pet memorial plaque is personalized with your pet's name and a photo of them. A wonderful memorial for the loss of a pet that will be cherished for years to come. 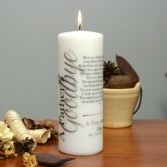 his elegant unscented, personalized memorial candle is the perfect sympathy gift. 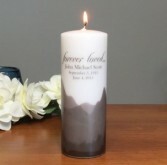 Printed on the candle is Ron Tranmer's poem, A Father's Goodbye and "In loving memory of" and is personalized with the loved one's name and dates. A Father’s Goodbye Bless my children Lord above, wrap them in Thy tender love. Keep them safe and free from harm, until once again they’re in my arms. My sweet children, I’ll miss you so. I’m sorry that I had to go The greatest blessings I ever had was being able to be your dad. I’m now at peace, my pain is gone. I woke up to a brand new dawn. Throughout your lives in all you do, remember forever, I’ll love you! 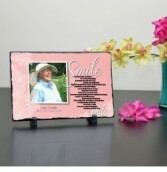 This plaque features a subtle pink background with white flowers printed on to the background featuring the poem "Smile" and can be personalized with your loved one's photo, name and optional dates. 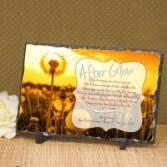 Plaque is made from slate stone with chipped outer edge and includes 2 plastic feet to display. 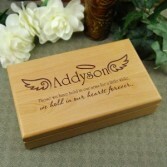 The Plaque measures approximately 7 ½” x 11 ½” and has the smile poem that reads: Smile Goodbye family and friends. My soul has taken flight. I’m entering the spirit world and, oh what a beautiful sight. Had I but imagined the beauty and love that is here, I would have came more willingly, and of death I’d have no fear. Happiness surrounds me. Such peace I’ve never known. I have the strongest feeling that I’ve returned back home. Should you be feeling sorrow, don’t weep too long for me. From earthly trials and suffering I am finally free. Goodbye family and friends. But only for a while. 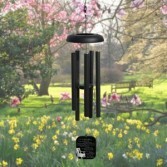 Live out your lives in happiness, and when you think of me…. smile. Add a name and dates underneath their picture. Call Carriage House of Flowers. 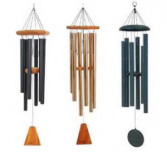 We have a whole line of Windchimes in other colors and sizes. We can personalize a sail with your loved ones name and dates. 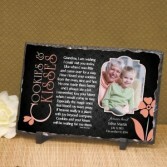 This personalized memorial plaque for the loss of grandmother features a black and gray background with a subtle flower design printed on to the background featuring the poem "Cookies & Kisses" and can be personalized with your loved one's photo, name and optional dates. 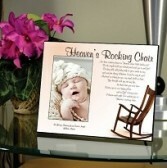 Plaque is made from slate stone with chipped outer edge and includes 2 plastic feet to display. The Plaque measures approximately 7 ½” x 11 ½”. The poem reads: Cookies & Kisses Grandma, I am wishing I could visit you today. Like when I was little and came over for a stay. How I loved your cookies from the oven, nice and hot. No one made them better and I always ate a lot. I remember, too, your kisses when I would come to stay. Especially the magic ones that kissed my tears away. If heaven really is a place with joy beyond compare; Cookies and your kisses will be waiting for me there.